Kanye is heading back to Chicago this month. Chance The Rapper recently suggested he and Kanye West would get in the studio to make an album together. 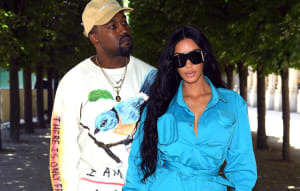 Those quotes came during the middle of Kanye's prolific time in Wyoming and now it seems that Ye is done in the mountains and is looking to head home. Speaking to Windy City Live on Wednesday, Chance revealed that he's making music in Chicago with his hero later this month. "Working under him, working with him on his albums is crazy, but having him tell me that he wants to produce my album and come to Chicago is like," Chance said, lost for words. "This month, we're working in Chicago," he then added. Check out the clip above. The Kanye West chat arrives at the 04:15 mark. Speaking in June, Chance suggested that his work with Kanye will result in a seven-track project a la Pusha-T, Nas, Kid Cudi, and Teyana Taylor's work in Wyoming. In addition to prepping new material Chance also got engaged earlier this month.